The great Summer Beavers Bend cabins are in high demand. We have a few openings at the end of June and Mountain Vista is almost packed in July. There are usually plenty of star sightings in Beavers Bend when the weather gets warm and Memorial Weekend was no exception. 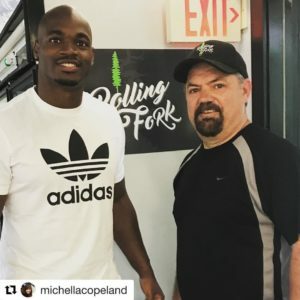 New Orleans Saints running back Adrian Peterson was seen at many locations near Broken Bow Lake. Peterson is pictured above with my lifetime pal, Skip Copeland. Skip owns the new Rolling Fork Takery restaurant in Hochatown. 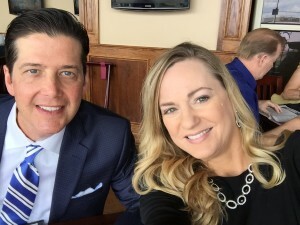 He and wife, Shellye, will make a dramatic impact on the dining scene in Beavers Bend. Rolling Fork is just north of Girls Gone Wine to the right. It will be open in the next few weeks. Trust me, you’ve never seen anything like this concept in Beavers Bend. Great organic food, live music and great people. 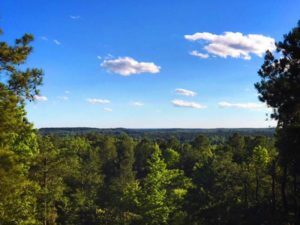 Our views and upscale amenities continue to make Mountain Vista a very popular cabin choice in Beavers Bend. We’ve never felt the need to gouge guests with cleaning, insurance and incidental fees. Others charge top-dollar for an armful of firewood…ours is free. A plethora of property managers now own many cabins in Beavers Bend. Mountain Vista remains different. It’s truly our vacation home. You deal with us, the owners, when reserving our property. We’re not managing 50-80 other cabins. Thousands read our blog each month and it’s very unpopular with some…those charging you needless cabin add-on fees. Contact us if we can help market your luxury Broken Bow cabin. Our three-decades of media and marketing experience can help accentuate your property. Are you receiving proper professional video and social media exposure? Summer Beavers Bend cabins are only a click away at BeaversBendVacations.com.